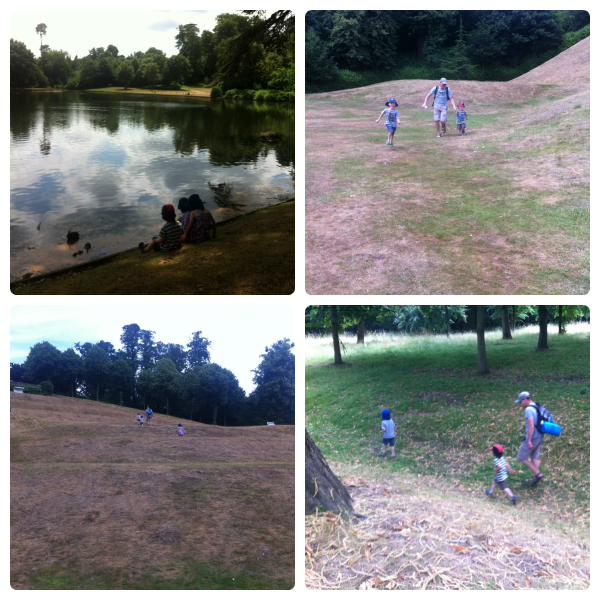 Yesterday we spent a lovely day at Claremont Landscape Gardens and Garsons PYO Farm. We started off at Claremont, arriving at lunch time and enjoying a delicious picnic in the shade by the lake. Once everyone had eaten we set off round the lake to discover and explore. The kids and Gordon walked up the hill, all the way to the top, and ran back down again! Then we headed over to the woodland, explored a ditch, hunted for grasshoppers and found a cherry tree with some delicious cherries growing on it that Gordon and Ben enjoying tasting! As were walked round the grassy area and woodland we counted butterflies and recorded our results with the Big Butterfly Count. We saw lots of Ringlets and Small Whites and a Gatekeeper. We continued round the lake, watching the fish jump out of the water to catch flies and the dragonflies zipping around. At one point we stopped to watch a dragonfly flying around the edge of the water and Jasmine noticed a Southern Hawker Dragonfly laying eggs in the bank right below where we were standing! 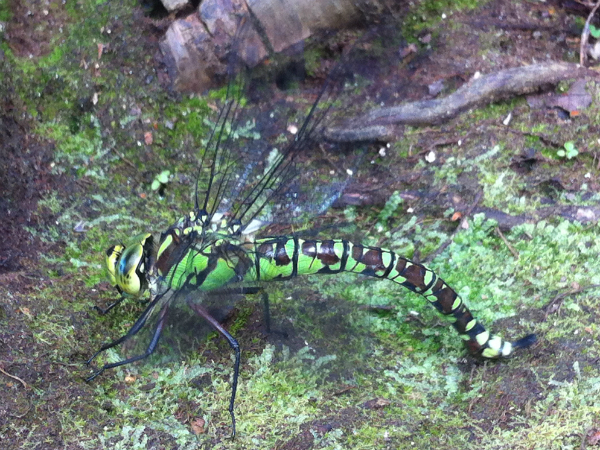 We watched it for quite a long time, having never been that close to a dragonfly before we were all amazed by how big it was! We walked round the lake and back to the car park, and then drove the 5 minutes to Garsons Farm. We have only been to Garsons once so far this year, for the asparagus picking, so there was lots we wanted to get today! 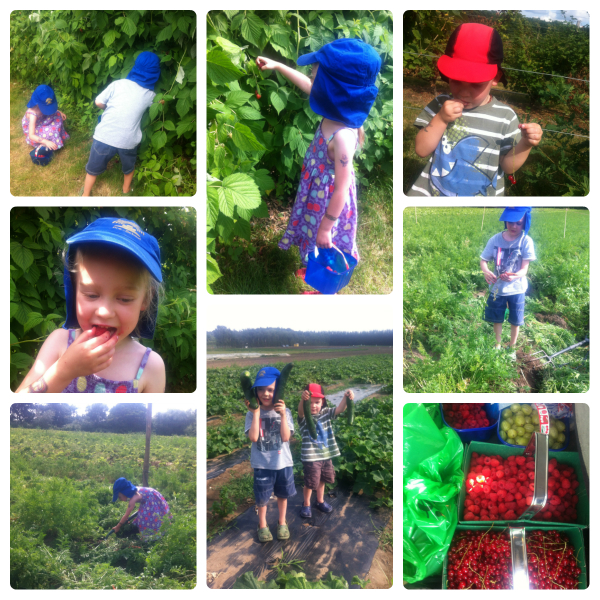 We started with gooseberries and raspberries then went to the redcurrant field. Next was carrots, peas, mange tout and finally cucumber. While the kids do enjoy picking the fruit and vegetables, they also enjoy taste testing what they can! I don’t mind them eating a few, however I try and make sure most of what they pick goes into the punnets! It was so late by the time we’d finished at the farm that we decided to eat out at Pizza Hut, the kids favourite! After dinner of pizza and ice cream we went home, well past the kids normal bedtime but well worth the late night as we’d had such a lovely day. Once all 3 kids were tucked up and asleep, Gordon and I started the long process of removing the redcurrants from the stems, ready for me to make jam today. And that is where I must go now, The fruit was stewed and the juice strained over night. Now to begin my first jam of the year. What a full day of outdoor fun! What a huge space to run around and in such a lovely setting, and the photo of the dragonfly is great. I love picking my own fruit and veg, and yours looked delicious. Thanks for sharing with Country Kids.